Overhead line supports are often seen as visual pollution. Therefore, a viable solution must be found to integrate them into the environment. I come as an artist, who has long been involved in environmental art, with a concept of transforming a heritage and industrial know-how into recognized works of art and registered for posterity. My concept intends to assert overhead structures: instead of hiding them, I’d rather transform them into artworks. My "Art-Pylons" are multi-support towers (low, medium and high voltage power line support, windmill mast, telecom tower for wireless transmissions, public lighting poles, etc.). How do you manage your artistic intervention? Sculptures: for new installations, through exploration of new forms for pylons to be implanted in any landscape, urban, or rural area. Sculptures are structured around the lattice module, which makes easier the construction of the pylons, and guarantees their resistance, while giving them a role of witnesses of our time. Art Installations: for existing towers, through a search for the best adaptation to the site, in terms of visual aspects, while allowing the incarnation of the infrastructure in artwork. My goal is to customize them on their spot, which is unique, to magnify them, to keep them as witnesses of our times. Instead of towers and antennas – kinds of anonymous giants – I see artistic works in harmony with nature. My Art-Pylons promote values that can sustain a new, positive way to manage the interaction between Man and Earth. My artistic approach is inspired by the visible-invisible antinomy: a pylon – as an energy carrier – is visible, but the energy that goes through the wires is not; antennas are visible, but radio waves are not. I’m feeling the mystical attraction of energy (speed, tension, paths) and the enigma that emanates from the waves: this invisible world vibrates in the air, flows in another dimension and leaves me totally free of my interpretations. But I’m also seeing the visible elements of buildings. Just look through a high voltage pylon: its structure is cutting the landscape in small geometrical pieces. They create a rhythm between the Full and the Empty on the background of the sky. Beyond living in coherence with our planet, my works also transmit another message on the relationship man has with the machine, and our dependence on technology. The pylon is finally a great puppeteer: it animates, moves the man who is attached and connected to it, holds him by a wire: the man seems to be subjected to the machine. However, he can question his links with it. Indeed, the role of man in front of the machine is ambivalent: sometimes he undergoes it (interdependence, attachment), sometimes he comes to transform it (engineering, design). In any day, who is the puppet of whom? At the same time that objects – pylons, for example – are humanized, would not we become automatons or robots? This will not be possible as long as art is available! How does that translate into your creative process? At the start, I must forget that pylons are metal giants and not pay attention to the technical, climatic, electrical, and mechanical constraints, thus giving free rein to my imagination. Then, elements are entering the game in terms of sensors, LEDs, insulators, rotors, antennas, dishes, etc. Hence, I’ve surnamed my sculptures and installations “High Tension“, and called my artistic approach “Electric Art“. When did come the first idea? The adventure of High Tension began a long time ago, while contemplating the landscape: marred with a lot of not-so-often-aesthetic human-made buildings. Looking at the huge electricity towers in the fields, I was imagining walking giants, transforming themselves, illuminating in the dark! Sometimes they were cats or dancers, other times, completely abstract forms. 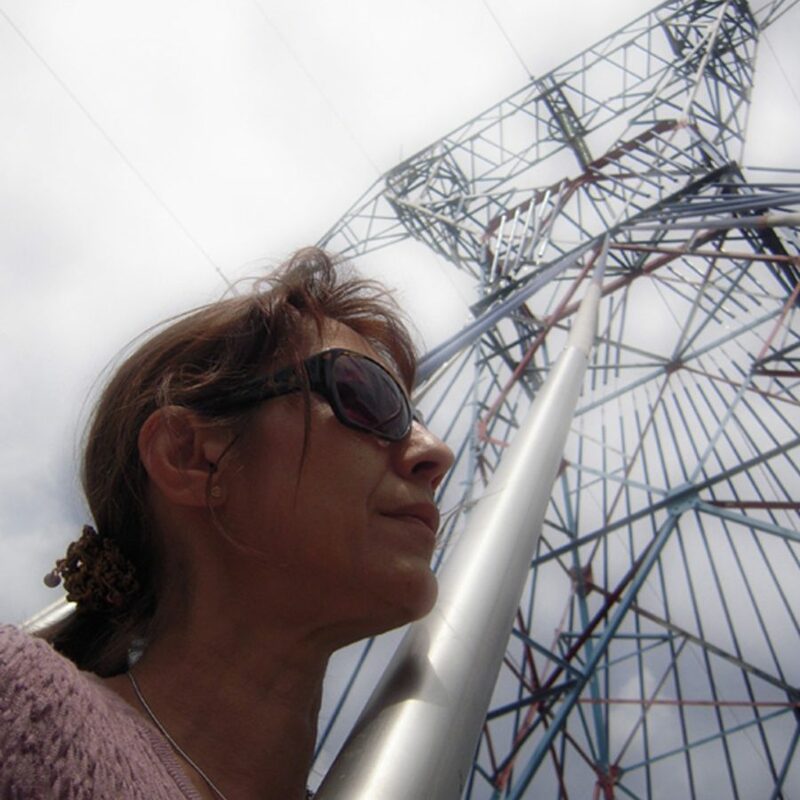 My Electric Art concept was born in 1999, as I read in the French newspapers that the overhead lines were supposed to go underground as soon as 2010 around Paris and 2035 in the whole country, thus making pylons disappear from the landscape. I decided then to intervene in my own way, trying to keep a few towers as a symbol of our time. My ideas turned into drawings, models, photographs, graphics, studies and projects. You’re talking about “modern menhirs”… what do you mean? I’m looking for a connection between Art and Energy within the landscape, providing another perspective to the visual aspect of our environment and an artistic touch to our industrial heritage. My artworks apply to any support: power line pylons, windmills, and telecom antennas, but also public lighting (highways, stadiums, streets, public spaces, or bridges), oil towers, urban furniture, etc. Rather than concealing them, I’d like to highlight them as menhirs of our time. Is there any symbolism in such an approach? Each artwork bears the symbolism of the area where it sits. It becomes a particular work in a particular place. A deepened reflection is led on the history, actual life and future projects of the place of integration. An example of such thinking is the monumental work “Source” which carries the symbolism of the town – Amnéville – along with its mining past and its hot springs network. While being at the state of the art, the materials must resist time and the weather. My sculptures are made of stainless steel, bronze, gold, or resins. For installations, the choice is wider: plastic cloth, wire mesh, stays, bungee cords, inflatable volumes, LEDs, etc. Glass or mirrors are interesting in architectural projects. Several alternatives are proposed and studied in terms of security, technical practicability, and durability. Are there any other important components? Colour is essential and deeply depends on the location site. The treatment of colour can be approached in different ways: pure colours, shaded colours, cover by gold leaf, etc. Lighting is another important ingredient. Again, the choice depends on the location. Lighting must materialize the presence of the power. It may simulate flashes of lightning, but also represent a bowl of energy, a cloud of light, or a rain of waves, create a waterfall of light. It may also evoke the invisible flows that carry the communication between us. With the lighting, I am transforming the Invisible into the Visible!